I just wanted to give you an update on Michael Rosa, a previous student athlete that attended your school. He is a junior who attends Valley Forge Military Academy in Wayne, Pennsylvania. He had a great football season this year. In 9 games he had 114 tackles, 12 interceptions, 2 fumble recoveries, 2 forced fumbles and 1 sack. He played many positions including linebacker, fullback, SB, punter and place holder. He was selected for All-Bicentennial and All Eastern Pennsylvania Honorable Mention for linebacker in his division. He had a great season and took the skills he learned at your school and applied them to his daily workouts. We just wanted to thank you for all your help. Michael hopes to have a great senior year and aspires to attend a division 1 college to play football. With what he has learned at your school, it is very possible that this can happen. So in a word – Thanks! Steve, hope all is well. I just wanted to send a note of appreciation and success story for your trainers, please pass on to them. Jordan plays soccer for a Traveling Team called “Match Fit Academy”. They are a very competitive team and play against the top soccer leagues in the Northeast Region throughout different states. This past weekend was her first tournament of the season and there was a huge difference with her speed and agility. That much of a difference that a couple of parents had asked me, on the sidelines, what kind of training Jordan had during the winter months. I depend on her soccer skills from her coach, but her speed and agility comes from Parisi’s. Not only did it help her against her competition but the confidence level on the field she displayed was night and day. I, myself as you know, was skeptical about the training but the proof came out this weekend from what I saw and others. Just wanted to send a note of appreciation because I was there first hand to see the difference. Thanks for the support and the training, keep up the good work. I had Steve work with around 24 of my basketball players prior to the season beginning, and I could see a marked difference in their speed and defense during tryouts because of it. On a scale of 1-10, I would give it a 10. Steve worked with me to individually to cater his workouts to exercises that basketball players need! His sport specific exercises and his levels of flexibility and creativity were very helpful for my team. I would recommend the Parisi Speed School to all athletes, and look forward to having my athletes work out with him during the summer and the fall! My son attended Parisi Speed School after ACL surgery and the many months of physical therapy that followed. The program at Parisi helped him get his speed back and gave him confidence that his knee was back to normal and ready for a punishing football season. He achieved first team NJAC for offense, led his team in rushing and was near the top in several categories in both offense and defense. He is currently in the recruiting process with several colleges for football. I would recommend Parisi to anyone who has a child who wants to improve their speed and agility and compete at a higher level in sports. The staff at Parisi is very nice and my son looked forward to every workout. Our son has improved his technique and speed tremendously since joining Parisi Speed School. His confidence in his performance has allowed him to try new positions once thought to be outside the realm of possibilities. He has surpassed even his expectations of the game! A family friend told us about Parisi’s and agility training. I must admit I was not a big believer at first but after a few months of my son being part of Parisi I had other parents from my sons football team notice a big difference in him. I was told many times how great he looked this year on the field and they wanted to know what we were doing different with him. I told them it was because of the agility training. So believe me, Parisi’s does work, it will make children better athletes. I have now signed both my sons up to get them ready for baseball. Training at Parisi has given my daughter the competitive edge she needs to compete at the highest level of youth athletics. Within the first three months of training at Parisi, her speed, her endurance, and her strength on the ball gave her the boost she needed to land a starting spot on the roster of the number one nationally ranked team in her age group. Competing on this national level takes consistency and purpose and the Parisi trainers provide that to my daughter at every session. They track her progress, they push her to achieve more and they customize her training based upon her needs. The trainers are engaged and responsive and Steve and his team have become a part of my daughter’s future. They are personally invested in her success and give 110% at every session. We have trained at both Parisi and Velocity and there is no comparison. The trainers, the workouts, the equipment are all superior and top notch. Steve Leo and his staff are capable of effectively training everyone from the 6-8 year old kid who is still developing coordination to the professional athlete and everyone in between. I think Parisi Speed School has helped my sons wrestling career by keeping him in the best possible shape he can be in. If a match lasts to the third period he usually can turn up the heat with his speed and strength when some of his opponents are tired and just trying to survive. In my sons first year at Parisi Speed School he went from 7th place in New Jersey Wrestling States to becoming a NEW JERSEY STATE CHAMP!!! He then followed that up with two NATIONAL TITLES!!! If you want your child to get to the next level in his/her sport Parisi Speed School is the place to train. The training hours are very flexible and work out well with my sons wrestling schedule. Parisi of Sparta has helped out my daughters soccer game tremendously. Not only is she in great shape from the training but her confidence on the field is a lot stronger. Her coach has relied on her to take a leadership role on the field and did not sub her out once all of last season, approximately 20 games. She played a full 60 minutes each game and this is due to her physical shape. She gives the coach 100%, which is possible because of the training she gets with the staff at Parisi of Sparta. She finished first in a mile run in her school, in 6:05, which is solely due to the physical shape she is now in. The girl that finished second is also a student of Parisi of Sparta! Steve helped me tremendously in building up leg strength and introduced me to a way of training that helped me have one of the best seasons of my career.Training with Steve helped me push myself to another level that I’ve never pushed myself to before. He motivates you to work as hard as you can and helps gets the best out of you. By the end of the workout I’m exhausted and his training gets me ready for the spring.I would recommend Steve to people of all ages. He’s great with everyone and really makes you feel like he cares about making you stronger and a better athlete. I began training with Steve when i was in high school. He taught me the proper techniques that encouraged me to become faster, stronger, and more explosive. As my career developed and I became older he continued to train me to become a better athlete. My training with Steve has always been purposeful and specific. Whether it was training every week in high school, training during my breaks in college, or during my breaks with the national or club team we always had a plan. Every session was focused on a specific need. And every session was adapted to fit what i personally needed as an athlete at that time. I would absolutely recommend Steve. I have been blessed to have worked with some of the finest strength and conditioning coaches and I know that Steve is one of the best. If you have dreams of becoming an elite athlete he can help you get there physically. He knows the physical demands of the highest caliber athletes and knows how to implement the proper training programs to allow athletes to maximize their abilities. all the best! As one of the first trainers I ever worked with I can honestly say Steve Leo helped me excel through out my high school days at Bergen Catholic and prepared me for a college football career at the University of Pennsylvania. As a dual sport athlete Coach Leo’s expertise in strength and conditioning enabled me to be at the top of my game whether it was on the football field or the basketball court. His enthusiasm, hard work, and knowledge of training created and environment where you had no choice, but to get better. I would rank Coach Leo’s training with the best in the business. He knows what his athletes are capable of and accepts nothing but your best. I absolutely would recommend Steve Leo to any athlete out there, his training techniques helped me be the athlete I was and I am sure you will benefit as well. I started training with Steve when I was in middle school and immediately saw an impact on my abilities as an athlete and lacrosse player. I became a stronger, faster, more dynamic player after training with him. When I was being recruited at the collegiate level coaches noted my strength and speed. Prior to attending Penn State to play lacrosse at the Division I level, Steve helped me train at the highest level and helped me become one of the strongest on my team as a Freshman. Steve is a very skilled trainer who focuses on making you the best athlete and person you can be. While training with him I did many lacrosse specific exercises that helped my career tremendously. He really knows what it takes to motivate athletes and take not only their physical game, but also their mental game to the top. Former New York Yankees Strength and Conditioning Coach Steve has demonstrated over the years the ability to research best practice’s and integrate these findings into his own program for optimum performance for his athlete’s. This is a true sign of a professional. Steve worked with me at a young age when my athleticism was lacking and helped me correct many of the flaws in my running technique. Steve is a great trainer who keeps workouts fun for athletes while maintaining a level of seriousness necessary to get work done & accomplish goals.I would definitely recommend Steve to prospective athletes looking to take their game to the next level. Unfortunately for me, I met Steve Leo after my athletic career. However, a few of my friends had trained with him, ultimately scoring some scholarships to play their sports in college. He has a way of pushing you to the next level without the yelling and screaming (to a certain point, of course!) He makes you feel comfortable with yourself as an athlete and like you could do anything. I met Steve in Sept 2009 when I worked with him at Parisi Speed School. I was straight out of college and fresh out of graduation robes when I started there. He made me feel comfortable not only as a trainer, but with myself as well. He taught helped me to become the trainer that I wanted to be. While at Parisi Steve trained us as well, teaching techniques along with the workouts. His workouts were great. Whether it was a light day or “sweat dripping down your face” day-we always learned something from them which I think can help most in the long run. Without technique what do we really have? Steve is without a doubt one of the best people I have met in my short 24 years. Not only is he fun person, but he has an amazing work ethic that rubs off on everyone one of his clients that I have seen. His sessions are fun yet intense mentally and physically. If you train with him, you will see results. Just be ready to put the time and work in that he will to give you! I would not only recommend him, I would insist on him. I trained with Steve when I was young. He was able to help me develop into the best athlete I could be. Difficult at times but always in good cheer, Steve at first taught me the basics then we moved onto more advanced techniques over time. Training with Steve Leo helped give me the confidence I needed to develop into an elite athlete in my youth. During my time at Parisi as well as after, I was able to train with various other personal trainers. Steve was the best trainer I’ve ever had to this day. I would highly recommend Steve Leo as a trainer to anyone trying to improve their athletic performance. Steve Leo helped me come back from retirement before I started my professional basketball career in Europe. After finishing college in 2009 and coaching for a year, I realized I wanted to play again, although I felt more out of shape than I had ever been. Training with Steve twice a week and doing the individual lifting program he created for me really helped me get back into shape and prepare for my debut season abroad. My first year in Europe I averaged 19 points, 11 rebounds, 2 steals, and 4 blocks per game. Steve took the time to figure out which areas I really needed to improve on to excel in my sport. We concentrated on those areas which improved all of my workouts, not solely the one-on-one workouts we had together. Steve Leo listened to what I was trying to do and worked with me to accomplish my goals, and helped prepare me for my first season as a professional basketball player. I am now playing professionally in Limoges, France. Steve was instrumental in giving me the speed and strength training necessary to be a successful Division 1 athlete. I had the opportunity to work with Steve from 8th grade through college where I was able to get faster and stronger to compete in high-level club soccer in high school and eventually at Villanova in the Big East Conference. He has a very strong knowledge of what it takes to succeed in any sport which allows him to tailor the workouts to each individual’s needs. Steve’s workouts are dynamic and varied to maximize the potential of each athlete he works with. His personality exudes motivation and self-confidence into everyone he trains, which are key in an athlete’s success. Steve provides high-level training that I would recommend to anyone looking to become a successful athlete. Steve literally improved my performance. I am the creator and lead performer of the rock ‘n roll nutrition show, Jump with Jill, and with Steve’s customized workout, I was able to improve my moves so I could better handle my intense physical schedule. In an added twist, I work with the NFL as part of their Fuel Up to Play 60 campaign and the players are always impressed with my tire flips and ladder jumps. I am functionally fit and have incorporated the workouts into my pre-show warmup permanently. once was. The training with Steve Leo is Top notch. Thank you for all the support through the years, training with you made a huge impact on my football career. Steven Leo has been instrumental in my son’s athletic development as one of the Top Youth QB Prospects in the Country. Steven is Dynamic, Passionate, and is always on the Cutting Edge of Technology. I’ve been around a lot of trainers throughout my playing career, and I believe Steven is among the best. If you are interested in taking your Sons/Daughters Total Athletic Performance in any sport to the next level, I highly recommend Steven. I trained with Steve Leo from the time I was a Freshman in High School all the way up till my Senior Year in College. He pushed me to succeed in both Football and in Baseball and helped me earn many honors on the way such as a full athletic football scholarship to the University of Rhode Island. Steve helped me reach my full potential as an athlete. He is the kind of guy who makes you wanna work for him each and every time you have a training session.I would rate Steve Leo on a scale from 1-10, a 10. He is as good as it gets.I have recommended Steve Leo to many athletes and will continue to do so in the future. Steve is a very knowledgeable trainer. He has trained my three sons and Football teams. I saw that they made huge improvements in all areas. He is dedicated to getting athletes better day in and day out. I highly recommend Steve to any one who is serious about becoming a better athlete. Steve has trained my football team on numerous occasions. His knowledge, teaching methods and rapport with the players are displayed during each workout. I would recommend Steve Leo to any player, coach or team looking to further their athletic pursuits. I had Steve work with around 24 of my basketball players prior to the season beginning, and I could see a marked difference in their speed and defense during tryouts because of it. On a scale of 1-10, I would give it a 10. Steve worked with me to individually to cater his workouts to exercises that basketball players need! His sport specific exercises and his level of flexibility and creativity were very helpful for my team. I would recommend the Parisi Speed School to all athletes, and look forward to having my athletes work out with him during the summer and the fall! Parisi Speed School has taught my daughter how to increase her running speed by explaining and working on the mechanic’s of the body that are involved whenever she attempts to run. She has used what she has learned in the basketball games she has played and the results are evident to those who have watched her over the last year or so.The training at Parisi Speed School is top-notched. All the trainers work hands on with the students and thoroughly explain whatever task that they want the athletic to attempt. When any of the trainers spots someone performing a exercise or drill incorrectly, they immediately explain and work with that particular athletic to correct their form. The trainers record and keep track of each students workout, and push the student to keep working to improve either their speed or strength. I would and already have recommended Parisi Speed School to numerous friends, parents & athletics that want to increase their speed and or strength, for any sport that they may strive to become better at. 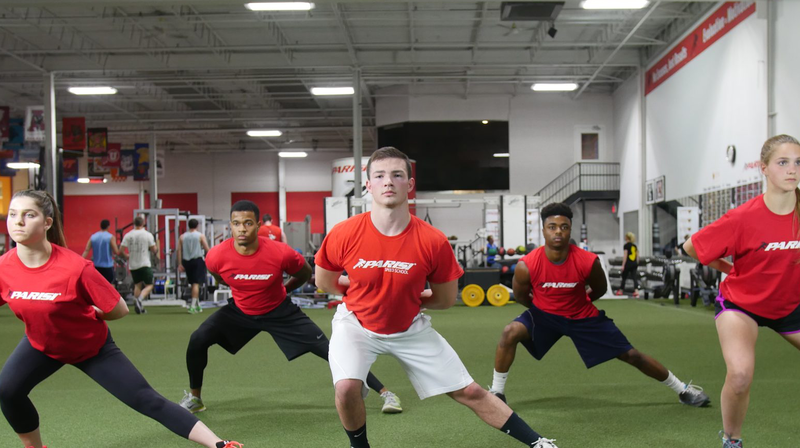 The training at Parisi Speed School does make a difference and can better your performance while on the court or field; and at the same time enhance your knowledge of your own body and what you can do to make your body perform at it’s highest level. During my first season as the head coach of Bergen Catholic High School Wrestling, 1998-1999, I consulted with and hired Steve to do our strength training. The training methods that Steve introduced were cutting edge for the time. The next season Steve designed a pre-season training regiment that went a long way to helping us capture a county title. During the 2003 season the entire varsity team trained at Parisi's Speed school with Steve and, much credit is given to Steve and Parisi's in helping us capture our 2nd consecutive team state championship. Throughout our team training sessions in the fall of 2002, the team worked with various Parisi trainers. All of the trainers had much to offer, but to a man, the team agreed that they had their best training sessions with Steve. I would highly recommend Steve without reservation.